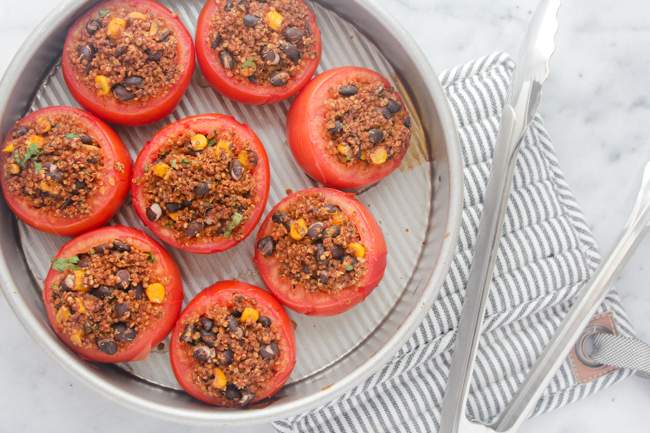 This recipe is bold, spicy deliciousness stuffed in the most perfect little tomato bowls. I dug up the picture from the first time I made this. I was in my first apartment, post college, and finally had a kitchen to experiment in. 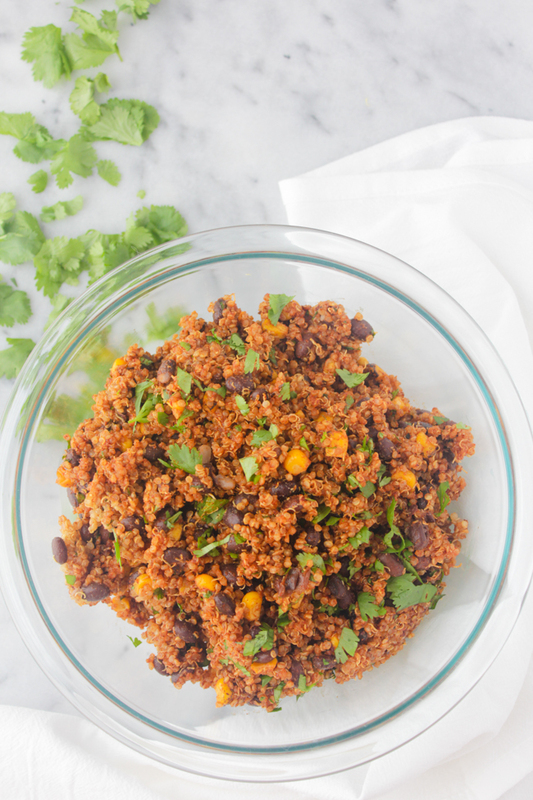 I knew I wanted to create something with quinoa, and since Southwestern flavors are so delicious, I thought I'd go that route. 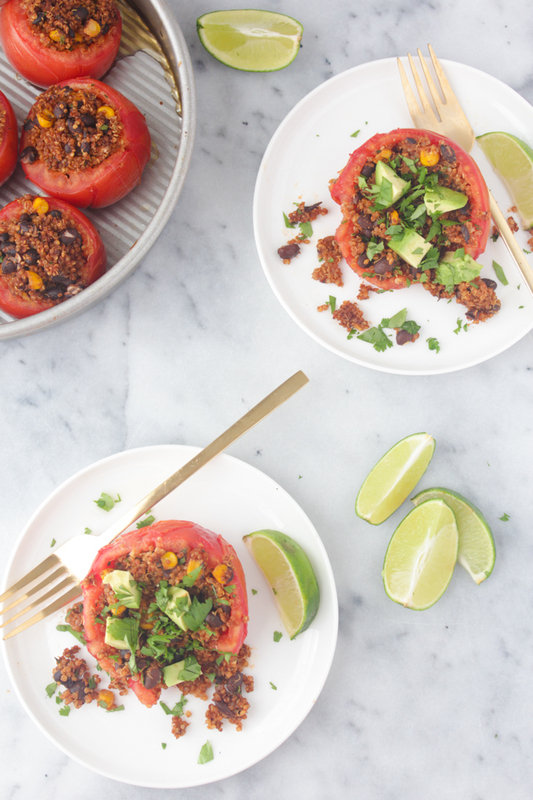 The filling is amazing on its own, but it's amplified even further by baking it in the juicy tomato bowls and topping it with creamy avocado, fresh cilantro and a squeeze of lime. The end result is a completely addicting, healthy and pre-portioned dinner. Just how healthy? This article by Well-Being Secrets shares 27 science-backed health benefits of quinoa ranging from its ability to improve digestion to its low glycemic index. 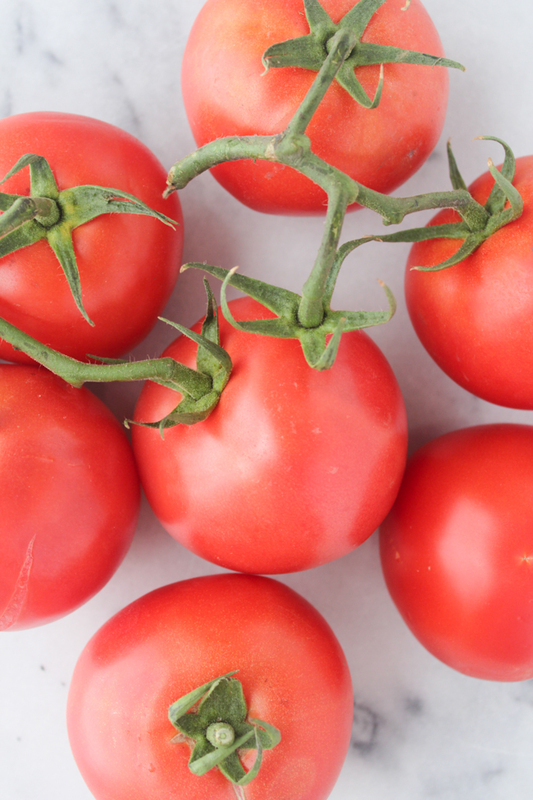 After reading it you seriously won't be able to get enough quinoa in your life, and these tomatoes are an excellent way to start. You know what else makes this dish one of my favorites? It freezes beautifully. I have a common problem when I cook and shoot recipes for my blog - there are so. many. leftovers. And, unlike many bloggers, I live alone and don't have a husband, kids, or even a dog to feed them to (my cat isn't having it). So after shoots I'm left with so much food in my fridge that I can't possibly eat before it goes bad. I feel like this is a common problem for people in their 20's who live alone. It's difficult to cook for one person, so you inevitably always have leftovers on hand, and it becomes a dilemma between not wanting to waste food and simultaneously being uninterested in eating the same leftovers night after night until they're finally gone. Jack suggested I start freezing my leftovers instead, so after shooting these tomatoes they went right in the freezer and I completely forgot about them until the week after 4th of July. I had been out of town for the holiday weekend and hadn't gone on my usual grocery trip so my fridge was completely empty. I was laying in bed struggling with the thought of dragging myself to Trader Joe's when I remembered all the meals I had waiting for me in my freezer and got so excited. These tomatoes were the first thing I wanted to have and, once heated up and topped with all the essentials, they tasted just as delicious as when I first made them. 1. Preheat oven to 375. Cook the quinoa according to package instructions. 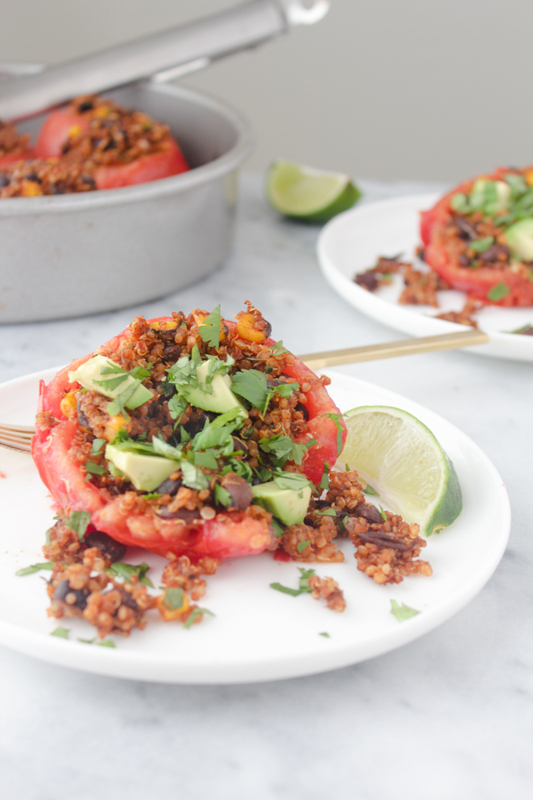 While the quinoa is cooking, slice the tops off the tomatoes and hollow out the insides. Set aside. 2. 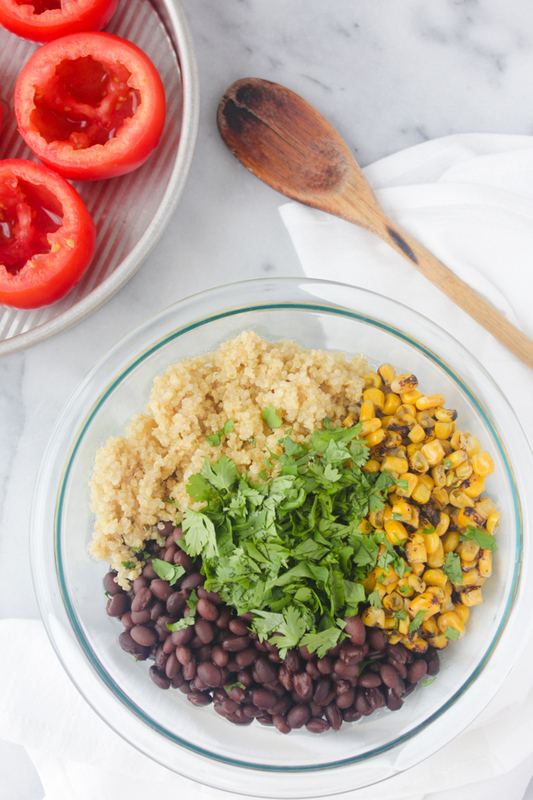 Stir the beans, corn, cilantro, nutritional yeast, ancho chili powder, salt and pepper into the cooked quinoa. Evenly divide the filling among the tomatoes and bake for 20 minutes. You may end up with extra filling depending on how large your tomatoes are, but that's alright because it's also delicious on its own. 3. Serve with sliced avocado, cilantro and a generous squeeze of lime. This looks amazing! And vegan too! I have some bellpeppers in the fridge that are about to expire! I should make this tonight! Yay!! It would be delicious with bell peppers as well. I'd love to hear how it turned out! This look delicious. would love to try. Yes! I hope you give it a try and let me know what you think. oh myy this look absolutely delicious!!! I am sooo going to make it - thanks for the inspiration! You're so sweet, thank you! 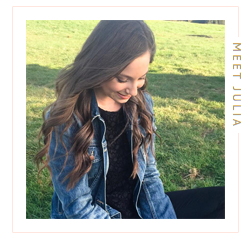 Definitely let me know what you think when you give it a try! 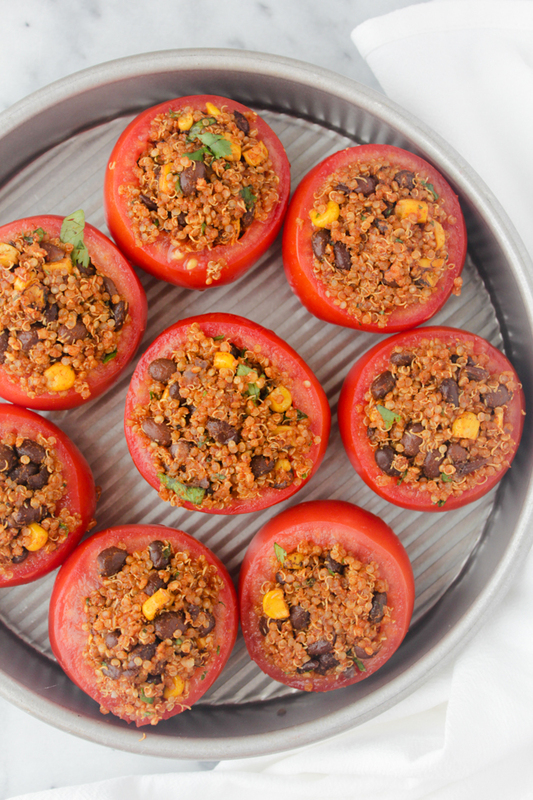 These look amazing!Quinoa filled anything is great, but I love that you used tomatoes! !